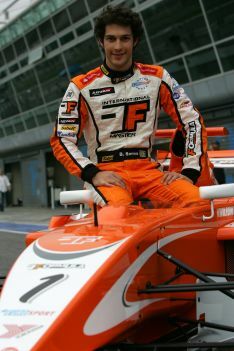 Bruno Senna, before he tested the Formula S2000 at Monza today. International Formula Master teams and drivers completed their first test of the brand new Formula S2000 race car at Monza today and unanimously heaped praise on the Series. The single-seater also got the vote of GP2’s Bruno Senna, who requested a guest-drive after becoming intrigued by positive reports on the car’s performance in the run up to its public track debut yesterday. The famous young driver was particularly impressed with the car’s cornering ability, but was caught out by the curbs at Ascari. The car suffered a heavy impact, damaging part of the rear, but Senna was completely unhurt emphasizing the car’s excellent safety features. Today’s IFM times at the historic Italian circuit had dropped by a second from yesterday’s session as the grid of 14 teams acclimatised to the car. Alan Racing’s Salvatore Gatto, was marginally fastest this morning and Oliver Campos Hull led the way for Jenzer Motorsport this afternoon. "It’s hard to get a car to handle well at high speed and not to under-steer or over-steer; it’s a really fine line but this car achieves that. This is not a car that has been adjusted too much. It’s a test car so to achieve that at such an early stage is very impressive. The down-force is working really well. It’s impressive how much speed you can take into corners. It’s probably the best car I’ve ever driven for changing direction. The way the car is working you can just switch direction quickly and it’s fine; very stable. I had a lot of confidence to push the car; it felt very comfortable. I think it should be good everywhere. The only place where I was struggling a little bit is with the bumps but there is a lot of adjustments to do and I’m sure that can be overcome. "I was disappointed at the way my test ended but I just got caught in a situation I wasn’t expecting. I turned at Ascari and caught the curb on the inside. When I landed the middle of the car hit the ground really hard and when that happens the tyres loose grip. The car still had a lot of load and spun to the wrong side." "It’s normal for the times to be coming down and with a couple more days here I think we would have been below 1min 44secs. This was my first time using the paddle gear shift and it’s difficult to get used to but the track is constantly improving, we’re constantly making changes to the car and I’m getting used to it so we are getting better and better. The car has been stunning. I didn’t think this kind of aerodynamic and mechanical grip were possible on such a fast track. It makes me very excited about competing later this year." "There are two different parts to Monza; the ones where you have a lot of down-force and the ones where you run more wing. You must therefore compromise your set-up in one half or the other. I chose to go slower in Lesmo and Parabolica, which I think was the best set-up here." "There was a great atmosphere here over the last two days; it’s a very professional series. I think the car’s performance has amazing potential and we’re concentrating now on getting ready for Valencia so we’re competitive. I didn’t know what to expect when I got here. Once I got into the car, though, I felt really calm; all my nerves disappeared. There are loads of experienced drivers in the Series but I’m quietly confident." The first round of IFM will be on 19 May at Valencia. For more information please visit www.formulamaster.net.